Not returning evil for evil, or insult for insult, but giving a blessing instead; for you were called for the very purpose that you might inherit a blessing. The house bustled early with sweeping, baths and a light breakfast of tea bread and coffee. The rising sun was struggling to burn its way through the fine Sahara Desert dust that continually wafts its way south across the West African sky during Harmartan. They dressed well and traveled the twenty-one kilometers from Kotokata to Adansi-Prasso for a small ceremony. 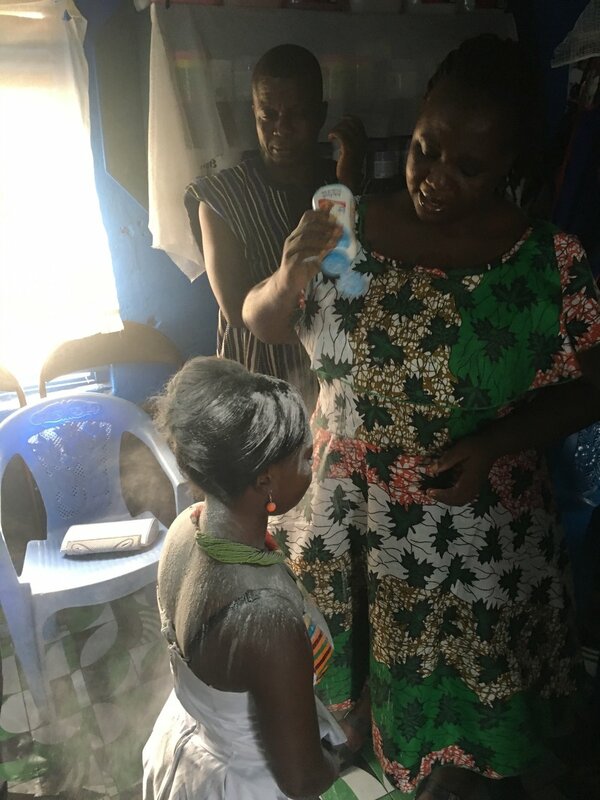 Four years earlier, Janet Samabea lived with her mother and grandmother in Kpassa, a small dusty market village along the eastern Ghana border with Togo. She swept the grounds, washed cloths, prepared meals and served her family as a seller of yams and kenkey. She was the last born of five surviving out of nine children including her deceased twin brother. And, at fourteen years of age, after watching her mother die, she had no one to serve and no place to go. She was the junior sister of the man’s newly adopted daughter and needed help. The mission team from America came to serve and Janet was invited to work. Money was sent for her to travel across country. She arrived with a small bag that contained everything she owned. After several days the sweat drenched dirty clothing of the dozen or so visitors was piled up on the ground outside in one huge heap. Janet fetched water from the local well and began washing the laundry with bar soap in three large tin wash basins lined up across the ground. She carefully examined each item for stains and used her hands to scrub, rinse and wring. After four hours the man came to her. She was still bent over in the blistering sun hard at her task. Her hopeful eyes met his as he saw her bloodied finger tips. “You need help,” the man stated. “Your fingers are bleeding.” She pleaded, “No Daddy. I will do it.” And, she did. For two weeks the man watched her relentlessly work at every task given and the many she took upon herself. The team left for America. She was paid and sent to Accra to stay with her older sister who lived in the squalor of an overcrowded slum in a rented eight by ten room. Fourteen years old and beautiful, with no formal education and in a city full of filth and vice, her prospects for the future looked dismal as best. Poverty and disease were at work in the most polluted city in the world and Janet was at its mercy. After a few weeks, the man received an invitation. Janet had found a beauty shop owner willing to train her as an apprentice where upon successful completion of a three year attachment she would become a licensed hair dresser. It would require a contract that placed her in subjection to her master. Initial supplies, uniform, monthly room and board and a deposit were required. Janet had no money. The man traveled to Accra, interviewed the Master and he and his wife agreed to sponsor Janet. The contract was read and duly signed. Janet worked hard and learned fast. But, before one year had ended, her Master’s husband left her. Janet had been serving her Master at her home in exchange for food during off hours. She, a fourteen year old girl, was falsely accused by her fiercely jealous Master of having an affair with her wandering forty year old husband and sacked from her attachment. And, once again, she had nothing and no place to go. “When you see something wrong happening in the world you can either do nothing or you can do something. And, I already tried nothing.” Steve Trevor to Princess Diana of Themoskira, Wonder Woman, 2017. She traveled to the man and served in exchange for food and a place to sleep. She served well once again. And, another opportunity for apprenticeship came from a small shop in Adansi-Prasso. The man and his wife sponsored again. Janet worked hard and quickly became her Madam’s best apprentice. After three years of living on her own in Prasso and visiting the man, his wife and her sister on Sunday’s, she had reached completion. She had passed the guild examinations and completed the contract with her Master. Today, she would receive the blessing that without, she would not receive her license. It was seven am in that hot little shop. And, the participants had gathered. The Dress Maker’s Guild President served as Master of Ceremonies and Janet’s Master and her Master’s Master assisted in the ceremony. The MC opened with songs of praise to Jesus Christ and a prayer of thanks for his provision and favor. Items required for a celebration had been requested by the Madam and were presented by Janet for examination. The Madam certified that the items required were present and acceptable. A platter filled with hair dresser associated objects for the ceremonial examination was presented, and Janet was commanded to kneel before the three Masters. Announcement was made that Janet was to be examined, and if she failed, would be required to extend her attachment for up to one year. Each item on the platter was presented and Janet was questioned. At the end of the lengthy affair, with all eyes on the MC, Janet was pronounced worthy. Then, with Janet on her knees, the MC took a large container of white talcum powder and began pouring it on Janet’s head as she spoke. Tears continually fell from Janet’s eyes streaking the white powder on her black face. The Master’s Master and lastly Janet’s Master repeated the powdering and words until Janet’s head, face and entire body were covered in white. The man watched with awe and wonder at the meaning of this baptism of powder and words that produced such heart felt emotion in the now eighteen year old Janet as she stood from her place, turned and embraced him. They held each other for a moment. They broke from their embrace as each took their seat. The man looked at himself. White powder covered his arms and blotched his person. Invitation was given for those present to impart council. Many spoke words of encouragement to Janet. She was instructed to reject Juju and embrace Jesus Christ by opening her own shop each day with prayers and praises to Him alone. She was entreated to place God first before all things. Closing praise and prayer were followed by warm minerals and fellowship. The man’s thoughts lingered on the powder and words. So, he took opportunity to make inquiry. The Madam informed him that the powder was a symbol of victory to the overcomer. The words spoken were blessings for the victor. He understood. Janet was indeed an overcomer. She had endured more than most people could survive and had achieved victory. Broken family, loss of a twin brother, three siblings and mother, no formal education, hunger, disease and bloody fingers didn’t stop her then and would not stop her now. She could build a shop of her own, receive pay for her work and train apprentices herself just as her Master and her Master’s Master. The man praised Jesus for the opportunity to witness such endurance and blessing from one so void of opportunity. He thought much about the motivation needed to endure a life filled with poverty’s powerful weapons pointed and firing continually. The blessing was and is the answer. Janet believed in it. It is the chief motivator, and it’s promise from the only true God through Jesus Christ our Savior and Lord is being lived out here on earth as it will be in eternity. Let us thank Jesus for the testimony of those like Janet who look to His blessing and seek to be His provision as He invites us to say yes to His command to make disciples of the nations. The man had not before witnessed a more true picture of following the Son. Jesus taught twelve men with three years of life, made provision on a cross for their victory and gave them the Holy Spirit as their power and council. Jesus lived day in and day out working and serving with the few so mankind might follow Him and them by doing the same. And yet, the man had experienced little witness to that life until Janet and others like her. He looks at the Gospels and Acts that he has read many times before and sees three years of Janet, her Master and her Master’s Master living them out in obedience to the command to follow the Son of God much in the same way as he sees Jesus Christ, Peter, Mark, John, Gaius, Barnabas, Paul, Silas and Timothy living them out in their pages. Jesus’s promise to make fishers of men from those who do what He did is happening in small shops across the world like God First Beauty Salon where on one hot morning the man saw a living breathing Gospel unfold right before his eyes without benefit of big screens, pulpits, cushioned pews, air conditioners and steeples. His truths are being proclaimed in the testimony of victorious overcomers like Janet who have been discipled by masters who were discipled by masters. It challenges the man and others to revisit the Gospels and their call on the living. It beckons them to live in like manner so that they might be His image, multiply it and extend His glory to the ends of the earth. That man asks each of you to pray that in the days Jesus has numbered for him, that he and others might heed the call to follow, endure the troubles of each day and look always to the sure promise of the blessing for those who would overcome, even eternal life. "He who overcomes shall inherit these things, and I will be his God and he will be My son.” (Rev. 21:7 NAS) May Jesus Christ be glorified among the nations, Amen.